A Painter´s Life on Planet Goodaboom: Don Quixote at Tripology! and I have to thank these people for making my day! And so it happened, Once upon a time, that I got some connection to a company called "Tripology" ... A strange name , isn´t? (well, Goodaboom isn´t less strange, is it?!!!) At least it´s what I thought in the very first moment, and I didn´t see the connection till I read what it is about. You want to know? Press here! Anyway... this is how we came into contact. Good vibes from the very first beginning, I must say: kindness, enthusiasm and dynamism. Some days later we were invited aboard, with the possibility to bring another guest with us. Being guests ourselves in this wonderful country which is Spain, who else but their national hero Don Quixote could we have chosen? 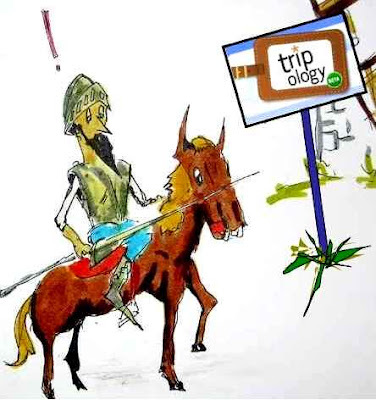 If you want to know how Don Quixote deals with the situation at Tripology, follow Don!